This is a difficult book for me to review, because I have such extremely mixed feelings on it. Before I started reading it, I saw so many raving reviews about is and I figured I would love it too, but then I started reading it and the story really just did not meet my expectations. I'll start off with what I really liked first. The angel mythology was phenomenal, I will give Jessica Shirvington that. She definitely did her research, and it shows because it was very well crafted and executed. Sometimes angels can come off as cheesy or corny, but I really like the theory behind Shirvington's angels. There is no fine line between good and bad, light or dark. The good can do bad, and the bad can certainly do good in Embrace, which made it difficult sometimes to know who was on what side. 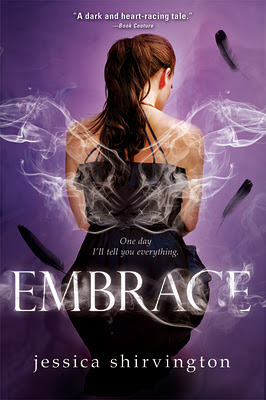 So, for the angel mythology, Embrace gets some points. But, I had two major problems with this novel. First, the main character Violet. I didn't like her, because she was extremely whiny. I understand, when you discover something so major and life changing about yourself, you're going to be freaked out. But she just shoved away all the people that wanted to help her, and started making some stupid decisions concerning who she trusted. I wanted to smack some sense into her quite a few times. And what really got me was towards the end. I saw what was going to happen a mile away, and she barely even knew what was going on. She did have moments where she stepped up and fought for those she loved, but those weren't enough to redeem her in my eyes. I'm don't want to spoil anything for anyone, so I'm trying to be vague here, but she just really disappointed me as a main character. My biggest problem with this book, however, was the love triangle. At first, I was pretty intrigued by Lincoln because he was sweet and cared for Violet so passionately. And then he just became the world's biggest jerk. If you love someone, you don't treat them that way, ever. I had a really difficult time believing in his feelings toward the end, because he just ran so damn hot and cold! And there's Phoenix. Ah, Phoenix. I have to admit, I actually really liked him. He's one of those bad boys, except he's quite literally the original bad boy. (Trying hard to stay away from spoilers here, but it's difficult with Phoenix!) I knew from the moment he was first introduced that both Violet and I, as the reader, shouldn't trust him as far as we could throw him. But, he's so deliciously charming and seductive that I just couldn't resist! I don't have an actual problem with him, I have a problem with his relationship with Violet. It just happened, out of nowhere. She meets him at a coffee shop one day, and then BAM, they're hanging out. And then BAM again, and they're... dating? When did that happen? Because I sure missed it. Again, I loved him, but I just didn't believe his relationship with Violet. I had a few other problems, such as Violet's father, or her best friend, but those are pretty insignificant compared to the 2 others I stated above. Overall, I give Embrace a shaky 3 stars. Mostly because of the mythology and Phoenix, those were the two redeeming qualities for me. I'll be reading the sequel, only because I really want to know what happens to him.